Where soil is being disturbed by construction there are several measures to effectively capture sediment before it leaves a site. 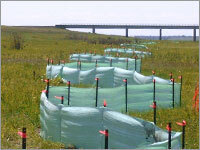 For in-water sediment control turbidity curtain is used adjacent to shorelines to keep sediment from moving further into wetlands, lakes, or streams. The geotextile curtains make use of weights and floats to keep it vertical in the water column. As with silt fences water can pass through the material but silt is trapped behind it. Both silt fences and turbidity curtains require maintenance to maintain effectiveness where sediment loads are high. Silt fence is a low curtain of material that is anchored into the ground that filters surface runoff capturing silt sized soil particles while allowing clear water to pass through. Typical installation involves excavating a small trench, placing the silt fence material in it and then back filling and compacting to create a solid sediment barrier. The fence material is tacked to posts to keep it upright and in place. Periodic removal of accumulated sediment is required to keep silt fences effective.